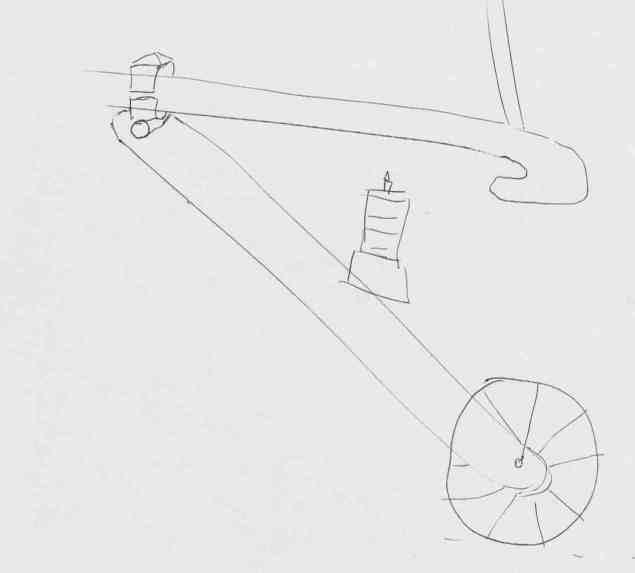 This idea is an easily detachable power pod for any type of cycle, able to lean with the machine and rise and fall with road undulations and be raised when no power is required. Email me for any comments. Easily attachable by sliding the pod onto a prefixed mount and applying a clip. This mount could be designed to fit almost any cycle rear fork as a bolt on mount or welded on as part of the frame. Not much wider than the bike it is affixed to and probably not any longer. Has a small drive wheel, possibly 12"-16". This allows for less gearing down. I estimate with a standard weed trimmer motor only a 4 or 5:1 gearbox will be needed. (Purchased from Scooter suppliers) The wheel could also have internal gearing of about 3 gears (EG Sturmey and Archer) if more range is required. The weight of the unit should give the required grip on the road. If not, the arm length could be experimented on so the unit drives itself onto the road as a result of the applied power giving additional grip as needed. Be able to be bump started. The motor could have no clutch for this to work - if the drive wheel can't get enough grip becuase of motor compression it may be easy to put downward pressure on the motor unit with your foot because of the position. Speed can be accurately predicted when fitted to any size bike and is not dependent on a certain bike wheel size as in hub motors for example. A bike handbrake lever can be used to raise/lower the pod onto the road. Some levers are sold EG from Greenspeed that have a locking pin - when the lever is pressed in, the locking pin can be engaged making the lever a handbrake and in this case raising the pod drive wheel off the ground. The unit ought be designed so as not to be fouled by the motion of the pedals. 2 tubes. This may be a little hard to route the chain so the chain doesn't foul on the arm. Experimentation needed. The unit placement is close to where a normal bike stand is usually positioned so may interfere with it's operation.